This is not the first time Cornucopia has attempted to bring serious ethical concerns to the attention of Farm Aid’s Board of Directors and management. At past concerts Farm Aid has showcased their sponsor Silk, the leading brand of plant-based beverages, then owned by the giant dairy conglomerate Dean Foods (a.k.a. WhiteWave). Cornucopia supplied Farm Aid officials with information concerning Silk abandoning U.S. farmers to purchase organic soybeans from China at cheaper prices. Another past marquee Farm Aid sponsor, also owned by Dean/WhiteWave, was the Horizon Organic dairy brand, with a considerable amount of their milk production coming from giant “factory farms” with a history of violating the organic federal standards. The current dustup alleges Bonterra, a brand owned by the giant Chilean conglomerate Concha y Toro, and operated under its Fetzer subsidiary in California, as misrepresenting its wine as organic. 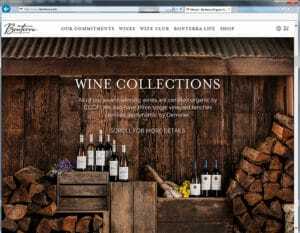 Their website clearly states that, “all of our award-winning wines are certified organic by CCOF.” The company also touts its “organic collection” on their e-commerce portal. Based on Cornucopia’s initial investigation, none of the company’s wine is actually certified organic. It appears that only the grapes are organic. Wine producers that add sulfur dioxide, a synthetic preservative, cannot legally qualify to represent their products as organic. Preservatives, including sulfur dioxide (or sulfites) are explicitly banned in U.S. organic food and wine production. Cornucopia suggests that whenever a company, like Fetzer’s Bonterra brand, plays fast and loose with the integrity of the organic label it materially injures ethical industry participants that go to the extra effort to qualify for organic labeling. In the case of winemaking that means meticulous sanitation practices rather than depending on synthetic preservatives to cover up potential flaws in their process. In 2011 Cornucopia supported certified organic winemakers in their successful effort to push back an aggressive lobbying campaign, by the wine industry, to weaken organic standards by allowing the use of sulfur dioxide in certified organic wines. California vintners, like Frey Vineyards and LaRocca Vineyards, successfully demonstrated to the USDA’s National Organic Standards Board that they could produce excellent organic wine without preservatives. “I’m afraid we’ve seen a bit of a pattern with Farm Aid promoting brands, owned by corporate agribusiness giants, that betray consumer goodwill and trust in the organic label,” added Kastel. Cornucopia’s grievances with Farm Aid sponsors date back as early as 2005 when the nonprofit farm policy research group filed legal complaints regarding Dean/WhiteWave’s corporate-owned Horizon dairy in Paul, Idaho, then milking 4400 cows, and a Horizon supplier in Pixley, California with a 10,000-cow herd. The California operation was decertified while, after all these years, charges are still pending against the Idaho operation. “No matter what evidence we supplied to Farm Aid they made excuses and told us that Horizon and Silk were “improving,” said Kastel. Farm Aid management blocked any direct contact with their Board of Directors, which includes founders Neil Young, Willie Nelson and John Mellencamp. “I am sure some of these prominent performers, with big hearts and an affection for family farming, would have shared our grave concerns about the ethical approach their organization’s management has taken if we had had the chance to engage in a dialogue. The failure to have a private conversation has forced us to widen the circle of this discussion,” said Kastel. The Cornucopia Institute has filed a second formal complaint, for adjudication by the USDA, against the organic certifier involved in Fetzer/Bonterra production, California Certified Organic Farmers (CCOF). CCOF, the largest certifier in the US, approved the use of its logo on the front of the label on the Bonterra wine products (their logo includes the word “organic” without qualification as to the “made with” status of the product). Cornucopia alleges that this is in violation of federal standards. Silk is another brand that Farm Aid promoted that became embroiled in a labeling controversy. As the company evolved, adding nut-based beverages to their initial line of soy “milk,” each new product, flavor and size added was conventional, not organic. Finally, Dean/WhiteWave serendipitously changed the labeling on their three original Silk soy varieties to “natural” from “organic.” They did so without properly informing retailers and signs continued to promote the products as certified organic until the issue was exposed in the media.